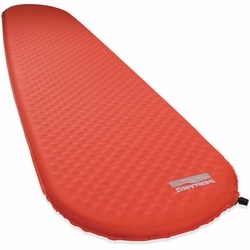 Therm-a-Rest ProLite Plus Sleeping Pad. The ProLite Plus mattress combines outstanding all-season warmth with the convenience of self-inflation. An upgrade to our exclusive Atmos™ Foam reduces weight and boosts compressibility. In addition, patent-pending diagonal channels in the foam retain more warmth than the more common vertical channels, making it the ideal choice for ski touring, cold weather expeditions and winter camping. Stuff sack included.